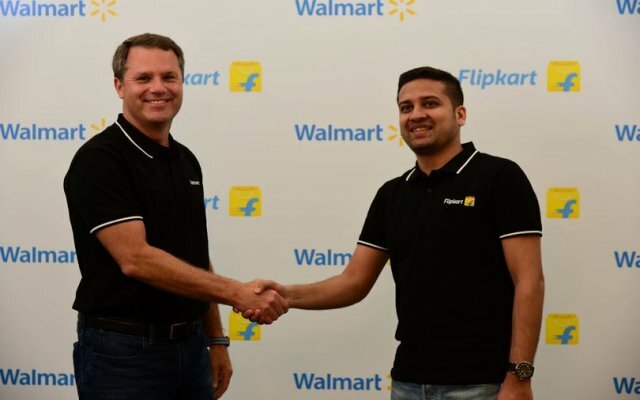 Walmart CEO Doug McMillon (left) with Flipkart's group CEO and co-founder Binny Bansal. The Confederation of All India Traders (CAIT) says the U.S. retail giant's buyout of Bengaluru-based Flipkart will create a monopoly in the retail market and drive mom-and-pop stores out of business. "This is the first phase of our protest. And if the government doesn't listen, we will decide our future course of action at our national convention in Delhi later this month," Khandelwal said. Satinder Wadhwa, a watch seller who attended the Delhi demonstration, said a cash-richFlipkart will be a major threat to small businesses like his own, which were already suffering due to a ban on high-value currency notes in Dec. 2016 as well as a nationwide sales tax that was introduced a year ago.